Heat oven to 350°F. Grease cookie sheet. Stir cookie mix, bananas and egg in medium bowl until soft dough forms. Drop by rounded tablespoonfuls 2 inches apart onto cookie sheet. Bake 10 to 12 minutes or until set (centers will be soft). Cool 1 minute before removing from cookie sheet to wire rack. Cool completely, about 30 minutes. Frost with frosting; sprinkle with chocolate shot while frosting is still wet. Stir in 1/3 cup chopped peanuts with the egg for extra peanutty flavor. 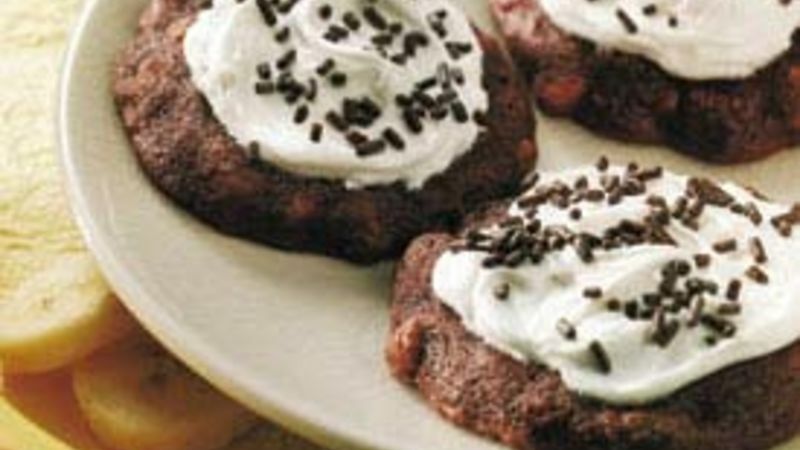 Sprinkle chopped chocolate-covered peanut butter cup candies over frosted cookies for an indulgent treat.